Thanks to the good folks at Manitoba Agriculture Food and Rural Initiatives, I found out who's been eating my spinach. It's the appropriately named Spinach Flea Beetle. 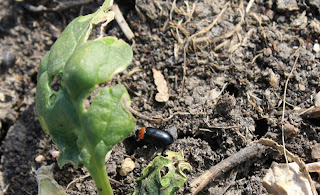 The insect in the photo is the spinach flea beetle, Disonycha xanthomelas. 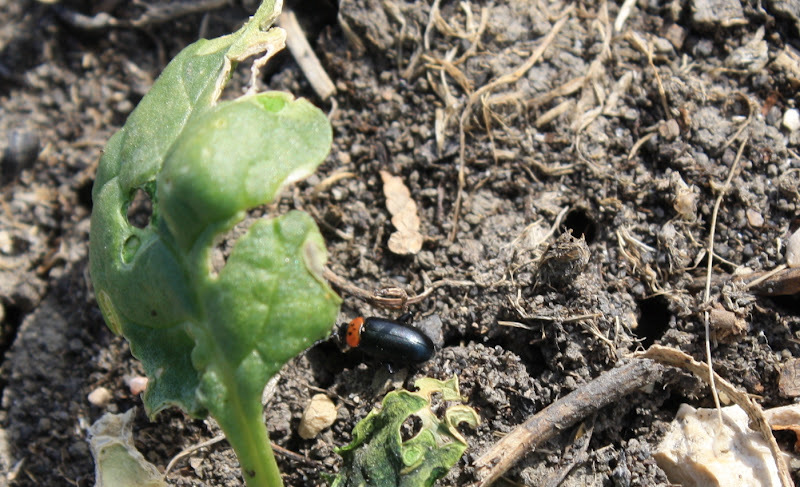 This is not a well researched species of flea beetle. A few of the other plants I can find reference to it feeding on are beets, Swiss chard, lamb’s quarters, and chickweed. One reference I have states that on rare occasions they are known to damage cabbage, horseradish, lettuce and radish. Both adults and larvae feed on leaves, which is interesting because larvae of most of our common flea beetles feed on roots. The “Handbook of Vegetable Pests” states that “generally, these flea beetles are not considered serious pests”. Foliar insecticides can be effective, but if you are leaning towards not using insecticides row covers may be an option to prevent feeding, if that is practical. Sounds to me like they've already done the worst damage. Since I use row covers over my cabbage patch to control regular flea beetles, we should be safe from further damage. I will keep an eye on my beets though, since I'm looking forward to a nice crop of them this summer. Let's just hope they don't find the spinach I have growing in the garden space around my house. So far, it looks very nice. Thanks John, for sharing your knowledge with us gardeners.